A traditional yurt is a portable, round tent covered with skins or felt and used as a dwelling by nomads in the steppes of Central Asia. 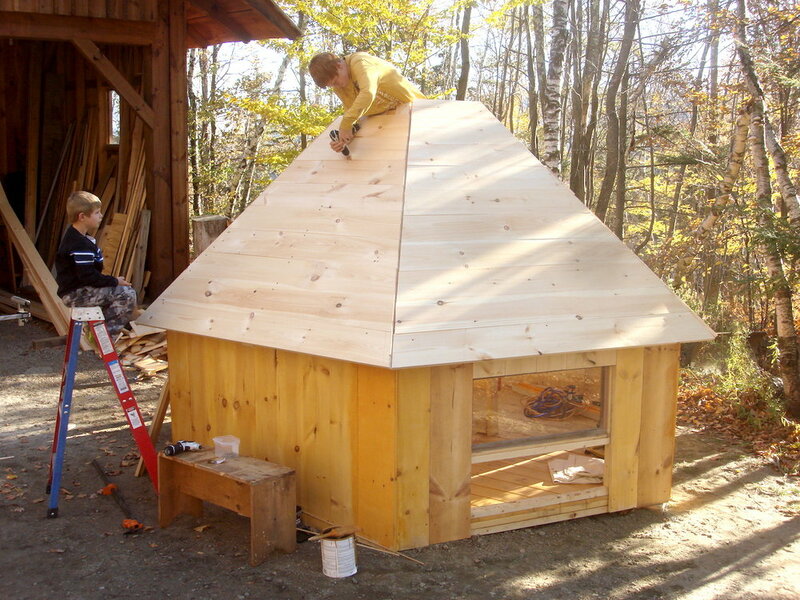 Our take on the yurt is a hexagon-shaped wooden structure inspired by the handmade yurts of Bill Coperthwaite, an educator and builder from Maine who travelled around the world teaching yurt building workshops. In this 7 week after school program, kids ages 7-12 met once per week to design and build the deck, flooring, walls and roof of a hexagon shaped structure. Applying wood stain to floor boards to protect from weather. Julia and Jordan screw studs to form a wall. Amy climbs to the top of the yurt. Zennor working on the roof. Students begin construction of the yurt deck. They draft and share concept sketches of the floor plan and begin measuring and cutting pieces for the deck frame. Kids learn how to align and install 1”x10” pine board flooring. They use an orbital sander to bevel the edges of each floorboard, and use drills and screws to begin attaching flooring. The group finishes attaching the floorboards onto the frame. They learn about the impact of weather on exposed wood and options available to weatherproof interior and exterior wood flooring. They apply this information by staining the yurt flooring. Students take a tour of the yurt structures at Knoll Farm built by Dan Neumeyer and Bill Coperthwaite. frame the yurt walls. The group collaborates on designing a layout which includes the placement of windows and dimension specifications of entryway. Students work with clamps and drills, taking turns building the wall frames.